New Itinerary for 2019! – Our Climb Mont Blanc week focuses on climbing the highest summit in Western Europe with a qualified UIAGM /IFMGA mountain guide. The training and acclimatization program involves technical training whilst reaching 4000m on the Gran Paradiso – acclimatizing in this way makes a huge difference on the final MB summit day. Mont Blanc itself will be attempted via the Gouter, Gonella or Grand Mulets routes. Our Mont Blanc trips now run in June and September only, when snow conditions are at their best for safe and enjoyable climbing; we also start our courses midweek to avoid the busiest nights in the huts. Both Neil and Jonny were absolutely brilliant guides and jolly good company. I have just had the best two weeks of my life – Unforgettable and I’m already thinking ahead to next years trip. Many many thanks. Just emailing to let you know what a great time I’ve had over the MB week. Dave and Phil were great fun to be around, as well as imparting a lot of knowledge along the way and I’m now definitely confident enough to go and start ticking some routes on my own. Please pass on my thanks and best wishes. I know where to come to if i need any more guiding! Back in the UK safe and sound, but already gutted not to be out in the Alps! Just wanted to let you know that Jenna and I had an awesome week with Dave and latterly Phil. The trip was well organised, great fun and Dave really came through on the extra crevasse rescue training I’d asked for – such a good confidence booster. All the best, and please pass on our very best regards to Dave for such a fantastic week. Fantastic time. Thank you all very much for a very active week and compared to last year’s debacle you are head, shoulders and the rest of the body ahead of your competition!! If you want a testimonial let me know. Everybody has come back satisfied. Again many thanks! The experience was ‘top drawer’ and the objective of summiting Gran Paradiso and Mont Blanc was achieved. The weather was on our side so this obviously helped and added to a great week. All information you provided by web site/phone/email prior to the trip was spot on regards required kit, itinerary, levels of fitness etc. With that in mind I came prepared and this assisted in a successful summit of both mountains. I would certainly use you guys again and recommend you to any budding mountaineers. 1st rate company. Amazing experience and thanks to the guys that helped us reached our objective! Reached two summits in one week, it was great! In terms of accommodation everything was great, very pleased with the special meals in Chamonix (brilliant) and in the huts that they would make an effort to serve me something vegan. Thank you very much for all support when my luggage didn’t turn u! I really enjoyed the trip, the guides were amazing and the accommodation logistics were all excellent. I’m already looking for next year’s trip with you! Thank you for helping me to achieve my goal. Hi Rich – just waiting for our plane home after an epic week. We had an amazing time, achieving things that were completely new challenges to us and we really loved the week. Just the right balance of challenge, learning, recovery and practice. The chalet in les bossons was fab, very comfortable and great food and staff. Lori was great. Clearly very experienced and made us feel very safe and well looked after. He was good at getting to know you and a very good communicator both in terms of what to do and learning new skills. This is an introductory level trip. To take part you should be at Fitness Level 3 and Tech Level 1-2 (see our Fitness/Experience guidelines below). You need good general fitness and experience in UK mountains (summer and winter). You should have used an ice axe and crampons before, either in the Scottish winter mountains (eg a winter skills course) or on alpine glacier treks. To make a successful ascent of Mont Blanc you need good cardiovascular fitness and plenty of stamina, as the summit day will involve 9 – 12 hours climbing at high altitude – please read our fitness and experience requirements below for further information and advice. You need to be aware when booking, that sufficiently good weather and climbing conditions are a prerequisite to make the ascent of Mont Blanc. Poor weather can occur at any time, but on average, the weather is good enough to make a summit bid on 70% of days in the summer season. Sometimes, during extended periods of very hot weather, the rockfall risk can increase to a point that it’s no longer safe to make an ascent (recently, this has only ever occurred in July and August, which is one of the reasons we now avoid these months for MB ascents). However, a fresh snowfall or drop in temperatures can improve conditions quickly again. If the weather or conditions on the mountain are not sufficiently safe at the time of your trip, then a high quality alternative on another peak will always be offered – if conditions are looking doubtful, we’ll keep you informed about the alternative plans and options. We use three different routes to climb Mont Blanc – the Gouter Route from Les Houches, the Gonella Route from Italy and the Grand Mulets Route from the mid station of the Aiguille du Midi Cable Car. Each of these routes involves 1600-1700m of ascent from the hut to summit. Route choice is determined by hut availability, the current weather and climbing conditions and group fitness, so you need to be fit enough to climb to the summit via any of these routes. This is a split ratio week, with 3 training days guided at 1:4, then 3 summit days at 1:2 ratio, with UIAGM guides. You should arrange outward travel on Wednesday, arriving by 5-6pm latest in time for the briefing at your accommodation. Your guide will run through safety routines and kit checks, as well as hand out any rental equipment for the week, before we go on to discuss everyone’s ambitions for the week, together with the current weather and mountain conditions and how these affect our planning. We’ll also have maps and guidebooks to show you, so if you’ve any further questions or last minute requests, then this is the ideal time to bring them up before we head on to dinner. PM Overnight in the valley. 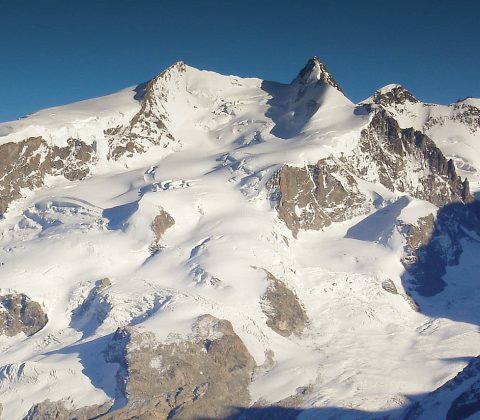 In the morning we travel to Italy and walk up to the Vittorio Emanuele Hut (2719m) in the beautiful Gran Paradiso National Park – there will be time to make any last minute food purchases etc en route. The hut walk takes about 2-2.5hrs and is the first part of our acclimatisation program – allowing you to spend as much time at altitude as possible during the week. 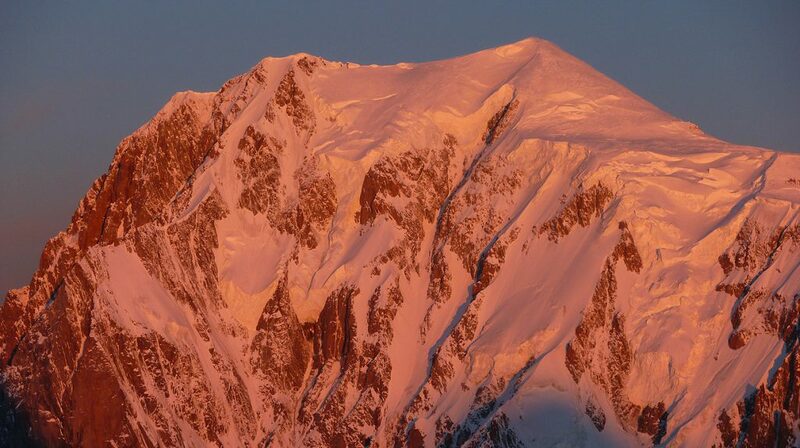 This extra night sleeping high early on makes a big difference on Mont Blanc. In the afternoon we do a ropework training session near to the hut – practicing knots for tying on in the middle and ends of the rope, learning how to take in coils and rope up correctly for glacier travel – maximum ratio 4:1. Friday – a very steady ascent of the Gran Paradiso, then return to the Vittorio Emanuele Hut for a second night. Saturday – descend to the valley and recovery day. Friday – ascent of La Tresenta (3609m), then return to Vittorio Emanuel Hut. Saturday – ascent of the Gran Paradiso, then return to the valley. 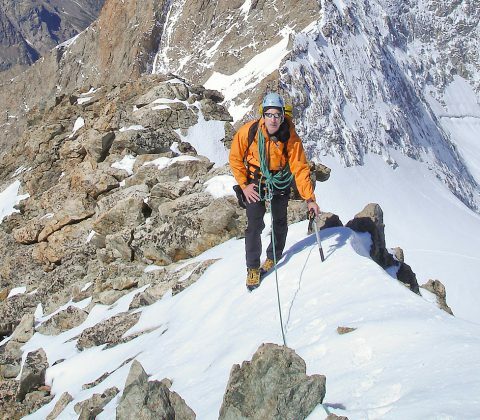 Plan A is hard work on the Gran Paradiso, but it gives you a lot more recovery time before the two big back to back climbing days on Mont Blanc, so this works well for many groups. Plan B gives you an extra summit, but less recovery time – so the group needs to be strong and the weather needs to be stable. Your guide will assess the weather conditions and group ability and decide on the best plan to maximize your chances of summiting Mont Blanc. Sat PM Return to Chamonix, overnight in valley. The Gran Paradiso in the only 4000m summit entirely within Italy and gives it’s name to the National Park that surrounds the peak. The climb is a steady ascent, mostly on snow, with a few steeper sections as the glacier gains height. Eventually the route leads out onto a wide glacial bowl, which is skirted in an anticlockwise direction up to the final summit rocks. The last 100m of scrambling to the summit is often busy, as teams pass back and forth along the same route, but the view is well worth it. Final preparations in the valley, before heading up to either the Gouter/Tete Rousse, Gonella or Grand Mulets Huts ready to make the ascent of Mont Blanc. As far as possible, this is a steady approach day in order to prepare for the big climb ahead. However, it’s still a long way up to the huts (the Gonella and Gouter Huts especially, which are a 5-6hr approach) – so you need to be prepared for two big mountain days, rather than just one. The ascent of Mont Blanc via the Gouter, Gonella or Grand Mulets Routes and the final Bosses Ridge – each of these is a big and strenuous climb. After a very early start from the hut, it’s a long climb through the night, where pacing yourself and having the determination to dig in and rise to the challenge are important. The lower section up to the Dome du Gouter holds no great difficulties when climbing via the Gouter Route, but on the Gonella and Grand Mulets routes there is some steeper terrain to climb in order to reach this point, where all the routes converge. Soon after the emergency Vallot Hut at 4350m, the climbing becomes steeper and narrower again. This upper section is known as the Bosses Ridge and it can often be very cold here, as it’s at high altitude, early in the morning and frequently exposed to the wind. When finally reaching the summit the views are truly amazing, but it’s still a very long way back down to the valley! PM Descend back to the hut and spend a second night there. AM Descend to Chamonix – or reserve day in case of bad weather, to make a final attempt at the summit. It is possible to reach the valley the same day as climbing Mont Blanc, but obviously this makes the summit day longer. Tue PM return to Chamonix. Return travel should be arranged on Wednesday morning, after your final nights accommodation. Early departures – if you choose to depart on Tuesday night, please leave plenty of time for repacking and the airport transfer. You will typically be back at the hotel by 4-5pm at the latest, so choose a flight departing Geneva after 9-10pm. 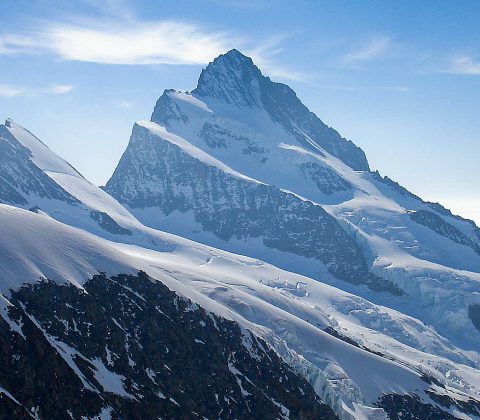 Europe’s highest mountain is justly famous, and is a popular target for keen mountain goers, both novice and experienced, from around the world. However it’s a tough and committing mountain and care should be taken to make sure you’re ready. Please use these guidelines to help you decide if the time is right. This is a key factor – you should be at Fitness Level 3 (see below) to enjoy climbing Mont Blanc. However, the fitter you are the more you will enjoy it and the greater your chances of success. Being fit also helps you to recover more quickly after the Gran Paradiso climb, prior to setting off up Mont Blanc. What shape you are has a big impact on your likelihood of success! Eg are you slim and athletic, a normal build, a bit overweight, or 1-2 stone or more overweight? If you are considerably overweight, your chances of making it to the summit are not high, even with reasonable fitness (although the two don’t usually go together), perfect conditions and good acclimatization. If you are carrying any excess weight, then you need to lose as much of this as possible before joining the trip. These must be good > perfect. Poor visibility, strong winds, low temperatures or fresh snowfall all increase the seriousness of an ascent to a much greater degree than they would on a lower peak and sometimes make an attempt too dangerous. The ideal is a calm, blue sky day with good firm snow conditions allowing for quick travel. Most people are sufficiently acclimatized after 3 days of training, sleeping up high for 2 nights and climbing the Gran Paradiso, but everyone responds to altitude in different ways and personal speeds of acclimatization vary widely between individuals. Past experience is a fair indicator – so if you have coped Ok at altitude before eg. on Kilimanjaro, or on a high altitude trek, then this should be good news. Conversely, if you have had problems or been slow to acclimatize before, then you definitely need to come out early, in order to pre acclimatize before the week starts – please contact us for further advice about this. You should be at Tech Level 1-2 (see below). You need some previous experience using ice axe and crampons before the trip, but further training will be provided to top up your skills if required – you also need to be comfortable and sure footed on steep hillwalking and easy scrambling terrain, as there are narrow and exposed sections on the ascents of both Mont Blanc and the Gran Paradiso. All of these elements trade off against each other to a degree, but the two most important things you can do to help yourself in the run up to the trip are: increase your cardio vascular fitness and lose any excess weight – ie start training! If you need to top up your fitness before this trip, please see our training guidelines. Sport climber/Intro trad climber. You have indoor or outdoor bolt protected sport climbing experience, or have seconded traditional naturally protected outdoor climbs up to V Diff/Severe standard. You have some UK winter hillwalking/Scottish grade 1 mountaineering experience using an ice axe and crampons, or have done some alpine glacier treks or easier alpine peaks to F standard. Intermediate trad climber. You have led single or multi pitch traditionally protected rock climbs up to Severe/VS and have some ice/mixed climbing experience using 2 axes and front point technique, seconding ice or mixed routes to Scottish grade 2/3. You have climbed in the Alps before on longer PD, or shorter AD routes. You are also familiar with multipitch abseil descents. Experienced all rounder. You lead multi pitch traditionally protected rock climbs at VS/HVS standard and multi pitch ice or mixed routes to Scottish grade 4 – or if you mainly climb with guides or seldom lead climb, you have extensive experience climbing at this standard and are very comfortable seconding climbs of this difficulty. In the Alps you have climbed longer AD routes, or shorter D ice and mixed routes with glacial approaches and abseil descents. Very experienced all rounder. You regularly lead multipitch E1+ trad rock and ice/mixed routes at Scottish 5+/WI5. If you mainly climb with guides or seldom lead climb, you have VERY extensive experience climbing at this level and are totally comfortable seconding climbs at this standard or above. In the Alps you have climbed longer D or above routes with complicated glacial approaches and descents.